Now there is a fun Frankenstein Tie Costume T-Shirt. The white t-shirt is available in styles and sizes for men, women, and kids. 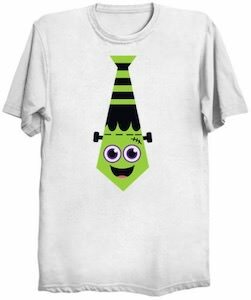 Wearing this t-shirt is like dressing up in style for Halloween as it has a necktie on it and this tie looks like a friendly Frankenstein and is green and black with a cute face. 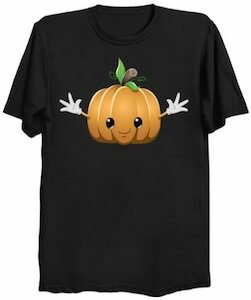 So now you can just wear a t-shirt as a Halloween costume that also has a friendly monster on it. And as the whole family can get one in their size you can all wear the same shirt as a Halloween outfit. If you want to be ketchup then you should check out this tomato ketchup costume t-shirt. The t-shirt is made from 100% preshrunk cotton and comes in styles for men and women in sizes Small – 3XL . The shirt is ketchup red and has a tomato ketchup bottle logo on it in white which makes it look really fun as now it will look like you are a bottle of ketchup and that makes this the perfect tomato ketchup costume t-shirt. Besides Halloween this shirt is great any day of the year especially if you like ketchup with all your food and maybe some extra ketchup with that. 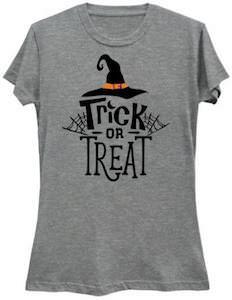 If you want a fun shirt for Halloween then check out this Trick Or Treat Witch T-Shirt. You can get this trick or treat t-shirt in styles for men, women, and kids and it is available in many colors and sizes too. On the t-shirt you can see a big witch hat on the top and some spider webs on the side and then there is the text “Trick Or Treat”. A t-shirt like this is great for wear all day on Halloween or just when the kids are coming to your home to collect the treats. 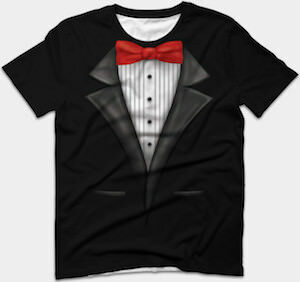 Now you can wear a t-shirt and looking all dressed up thanks to this Bow Tie Tuxedo Costume T-Shirt. 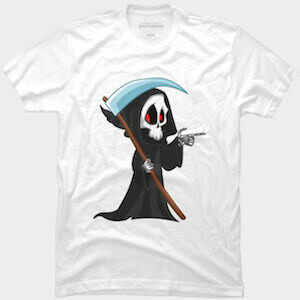 The costume t-shirt is available in sizes Small – 3XL and in styles for both men and women. The t-shirt is black but the front looks like a nice suit as there is a red bow tie, white dress shirt and a black suit jacket on top and all that makes this look like a nice tuxedo. So now you can just wear a t-shirt to your fancy party or keep this as a funny costume t-shirt maybe even for Halloween. Now you can become a zombie by simply wearing this zombie costume t-shirt. The men’s t-shirt is available in sizes Small – 3XL and has a print all over including the front, back, and sleeves. 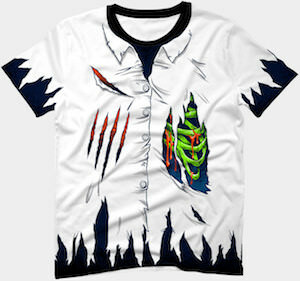 The t-shirt looks like it is ripped and you can even look inside and see a green zombie skeleton. A t-shirt like this is an easy Halloween costume but can be worn anyway you feel like a zombie and could really enjoy a meal of brains. If you really would like to be even more zombie then you can choose to do some scary makeup and you are set for Halloween. 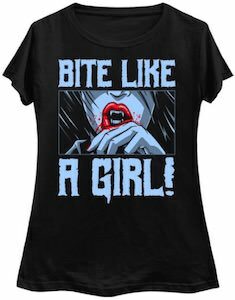 If you like a fun vampire t-shirt then you should check out this bite like a girl t-shirt. The vampire t-shirt is available in black and navy blue and comes in styles for men and women and in sizes Small – 6XL. On the shirt you can see a square and in it you can see a part of a girls face and as you can see she has vampire teeth and there is blood too and then around the sauce it says in big light blue letters “Bite Like A Girl!. So now you can promote vampires by wearing this t-shirt. 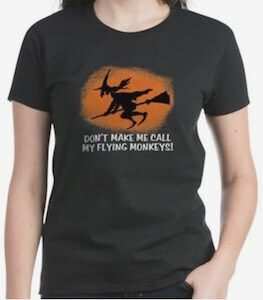 Now there is a Don’t Make Me Call My Flying Monkeys T-Shirt that makes you ready for Halloween. On the shirt you can see a orange circle that could be a the moon in the sky and in front of it you can see a silhouette of a witch flying around on it’s broom. Below the witch it says “Don’t Make Me Call My Flying Monkeys!” and that does mean that you have the power to call the witches to protect you and attack others. You can get this Halloween witch t-shirt in styles, colors, and sizes for men, women, and kids.